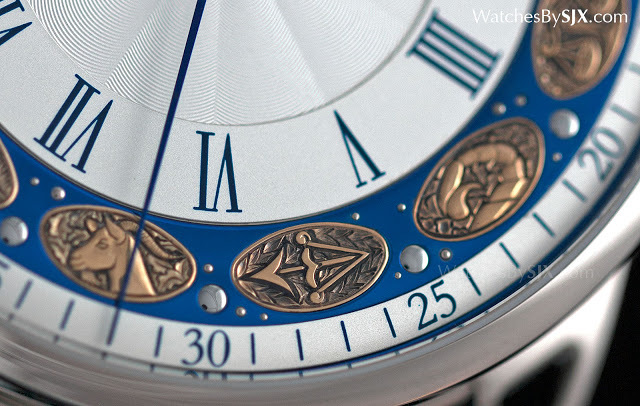 Introduced earlier in 2015, the DB25T Zodiac is the latest variant of De Bethune's tourbillon wristwatch with deadbeat seconds, featuring a dial with an elaborate zodiac themed decoration. The De Bethune DB25T Zodiac is based on the DB25T of 2012, a hand-wound wristwatch powered by a wonderfully elaborate movement with a tourbillon regulator and deadbeat seconds. The Zodiac suffix refers to the new dial, decorated with a dozen solid gold medallions hand-engraved with the 12 signs of the zodiac. 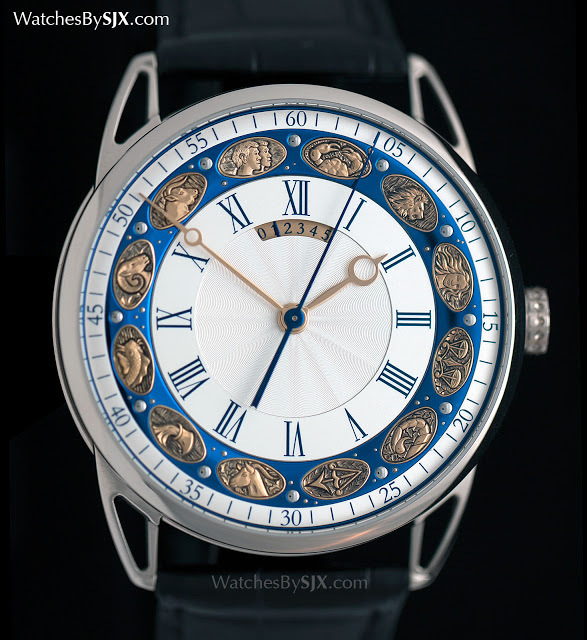 Visually reminiscent of certain 19th century pocket watches, a period De Bethune co-founder Denis Flageollet is particularly fond of, the dial has a central silvered, guilloche section bordered by blue Roman numerals. That’s ringed by a chapter ring in mirror polished, heat blued titanium, a material synonymous with the brand. Representing the night sky, the brilliant blue chapter ring is inlaid with tiny white gold spheres as stars. 12 medallions are set into the chapter ring, in between the hour markers, one for each sign of the zodiac. Each medallion is 18-ct. gold and hand engraved by Michele Rothen, the same craftsman responsible for all of De Bethune’s elaborately decorated timepieces, like the DB25 IX Maya, the DB25 Imperial Fountain and most recently, the DB25 Quetzalcoatl. The aesthetic is baroque, a style that looks heavily decorated at a glance. 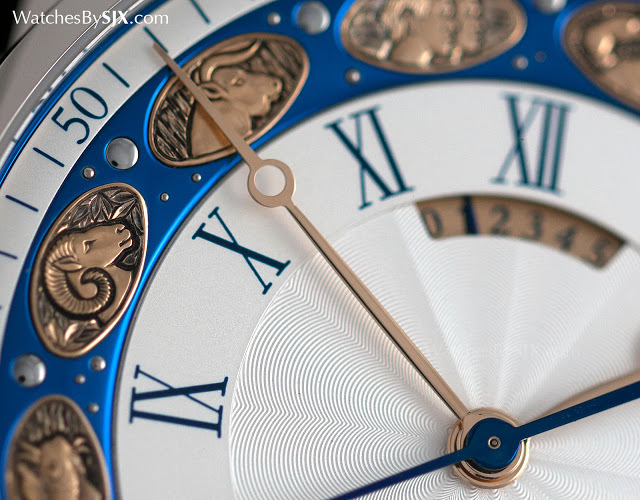 In that sense it differs from other De Bethune timepieces, which tend to be space-age and incredibly shiny, or having intricate details visible only up close. The rear reveals the DB2109 movement, a hand-wound calibre with a four day power reserve. A small window just under 12 o’clock on the dial is the power reserve indicator. 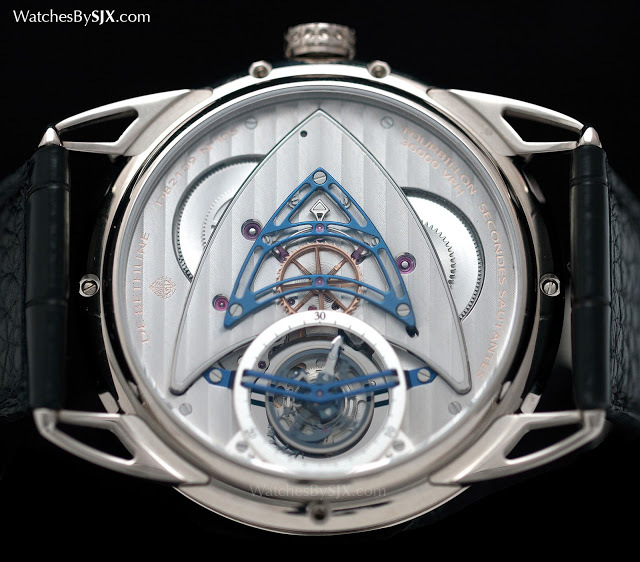 The movement has a large arrowhead-shaped bridge, with a small, skeleton bridge mounted over it for the dead seconds mechanism. That is made up of two pallet forks and a pair of solid gold escape wheels, giving the dead seconds its one-second ticks. 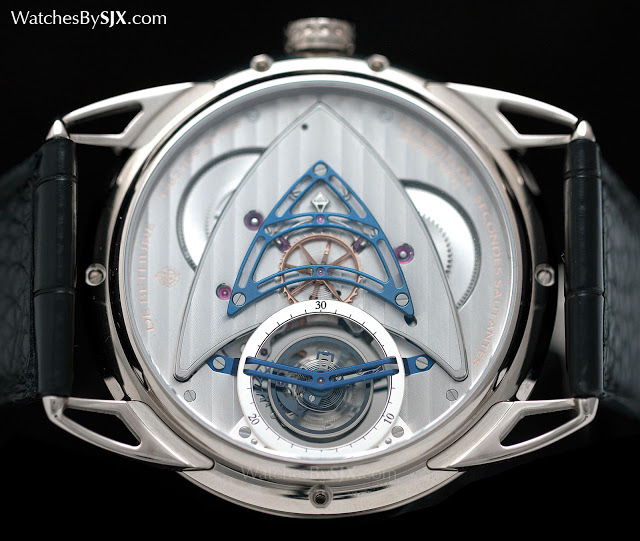 And right below the dead seconds mechanism is De Bethune’s patented high speed tourbillon, making one revolution every 30 seconds (most tourbillons do that in a minute), while beating at 36,000 bph (instead of the usual 18,600 bhp). That’s possible because the tourbillon is exceptionally light, with a silicon cage, balance wheel, hairspring and escape wheel. 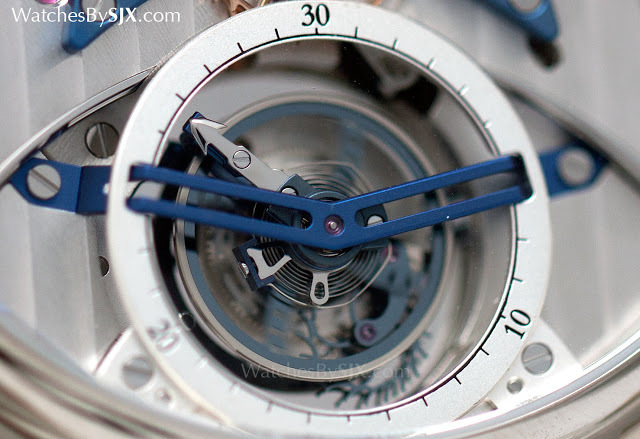 The case is white gold and 44mm in diameter, equipped with De Bethune’s trademark skeleton lugs. The DB25T Zodiac carries a price tag of SFr250,000 before taxes.